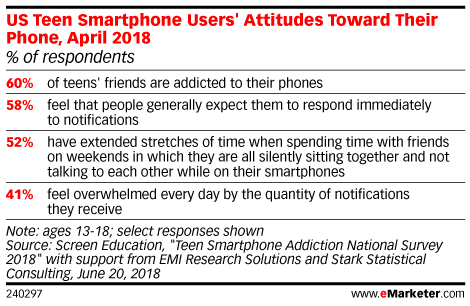 Data is from the June 2018 Screen Education "Teen Smartphone Addiction National Survey 2018" with support from EMI Research Solutions and Stark Statistical Consulting. 1,017 US teen smartphone users ages 13-18 were surveyed online during April 18-25, 2018. Screen Education is an organization dedicated to mitigating the negative consequences of screen addiction. EMI Research Solutions and Stark Statistical Consulting are both market research companies.